Compound butters are delicious and easy ways to add extra flavors to your food. A compound butter is a butter that has additional flavorings added to it, including honey, herbs and spices. Once the butter is made, it only takes seconds to turn bread into garlic bread or toast into cinnamon toast with a one-step spread. 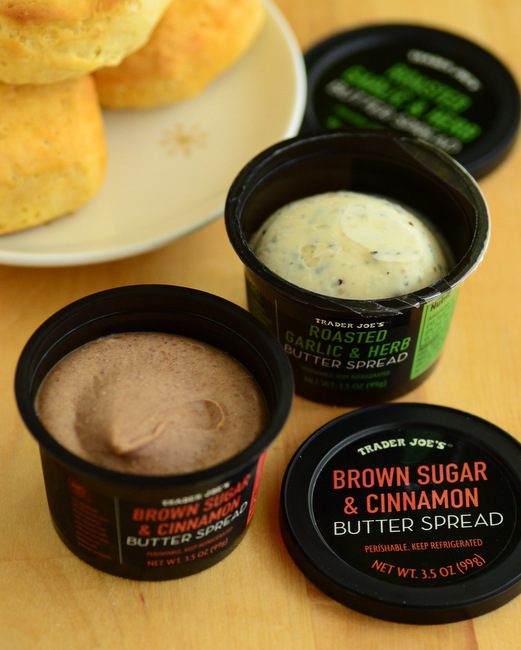 I noticed that Trader Joe’s recently introduced two new products to their refrigerated case: Brown Sugar & Cinnamon Butter Spread and Roasted Garlic & Herb Butter Spread. These are both compound butters, one sweet and one savory, and they offer an easy way to amp up the flavor in your cooking. The spreads are made with real ingredients – including garlic and brown sugar – and start with real butter, just like a compound butter that you might make at home. They are packaged in relatively small 3.5-oz containers that make them a better choice for smaller projects where you don’t need a huge quantity of butter and might be better off making your own. The Brown Sugar & Cinnamon Butter Spread is an excellent choice for toast, biscuits or muffins. It has a nice balance of butter and sugar, without being overly sweet. It also has just the right amount of cinnamon. I’ve tried packaged compound butters before and, in some of them, the sugar was grainy and the spices were so prevalent that the butter felt gritty. This butter is smooth and melts well, and it truly feels like the sugar and spice have been well-incorporated. As someone who likes cinnamon sugar on toast, this one is a winner for me.